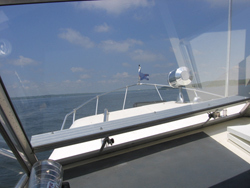 View from inside a boat on Saylorville Lake. Boaters are being reminded about a change in Iowa law taking effect across the state’s waterways just ahead of the busy July Fourth holiday. The legislature this session approved a lower legal blood alcohol limit for those operating a motorboat or sailboat. Officer Shawn Meier, with the Iowa Department of Natural Resources, says the move from .10 to .08 places drunken boating laws in line with those for other motorists. “When people are boating, a lot of times they trailer out to the boat ramps…they’ve driven out there. And they get intoxicated, they’re maybe between .08 and .10 and now they are getting in their cars and driving home. We want to stop that process of getting intoxicated and operating a motor vehicle,” Meier said. The new law goes into effect July 1st. Meier does not expect a big increase in the number of drunken boating arrests this year because of the change. “A lot of people have started getting a designated driver and paying attention to the amount of alcohol they’re consuming…so, I don’t really think we’ll see a spike in numbers,” Meier said. People convicted for operating a boat while intoxicated will lose their boating privileges for a year. Meier says an arrest for boating under the influence is a serious misdemeanor but has no effect on a drivers license.